From nine countries, thirteen new citizens at naturalization ceremony. With this stirring and sprightly Cohan tune the recently heralded 65th Infantry “Borinqueneers” and the rest of the nation’s troops marched into the First World War in 1917. Although the national holiday honoring the flag was established by President Woodrow Wilson in 1916, it has historically had special significance in Philadelphia, the home of Betsy Ross who, according to legend, knitted the 13 stars and stripes on a design established by the Continental Congress on June 14th, 1777. In 1937, Pennsylvania became the first state to designate June 14th as Flag Day. This real Betsy Ross looking well for her age. In addition, the day coincides with another anniversary, as exactly two years earlier, in June 14, 1775, that the Continental Congress – meeting in Philadelphia- created the “Continental Army,” precursor of the U.S. Army. During the opening of day-long ceremonies at Independence Hall, some 50 recruits were inducted into the U.S. Army. 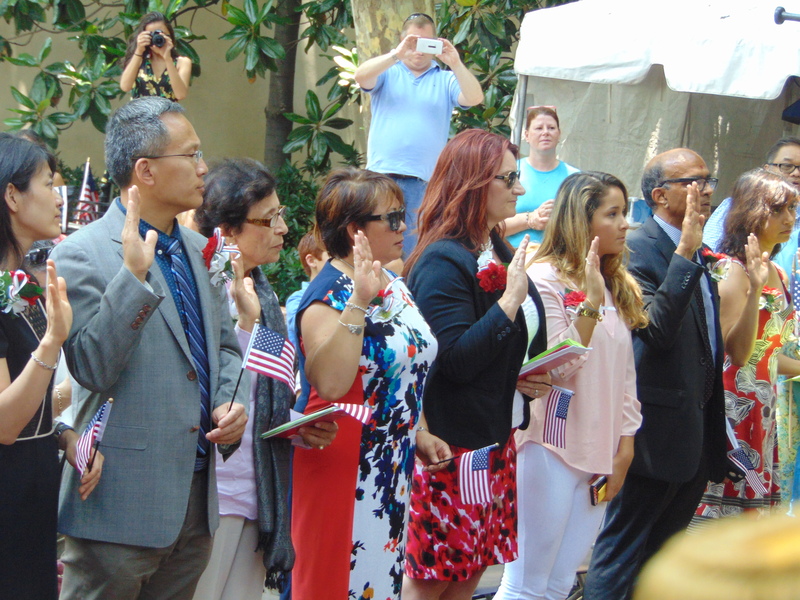 Under a canopy of trees at the 2nd and Arch street home of Betsy Ross, a noon day naturalization ceremony conducted by federal Immigration officials saw 13 immigrants from nine countries sworn-in as citizens of the United States. Among the nations represented included were Ecuador, China, Cambodia, Jamaica, Philippines. 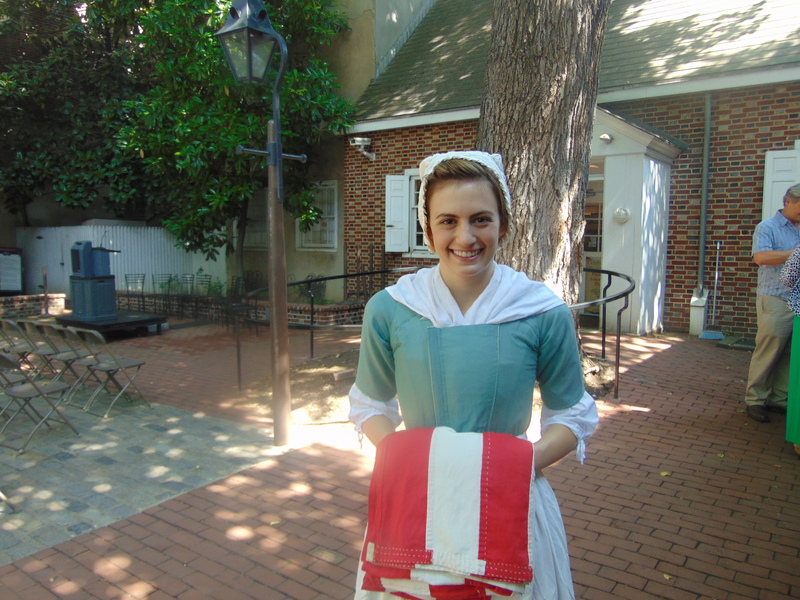 “Your children and grandchildren will never forget what you have done here this day,” noted the Director of the Betsy Ross House. 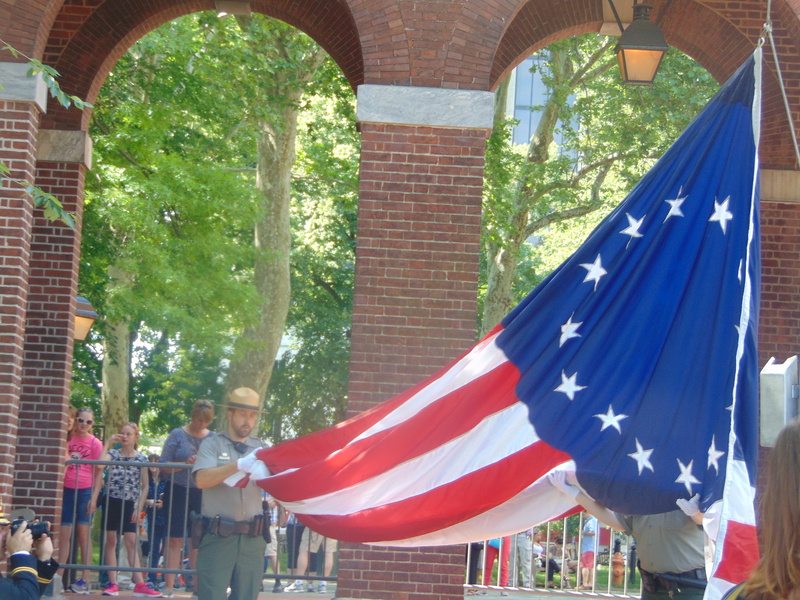 Stars and Stripes unfurled at Independence Hall.